I was having a conversation with a coworker recently about supporting children who come from different family configurations. I told him that I really enjoyed using multicultural play sets, or block people, to allow the child the opportunity to build a model of his own family in dramatic play. 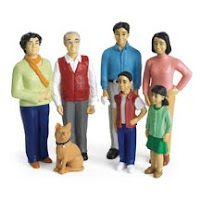 Even though many of the play people produced commercially come in racial family compositions, I like to get them all and allow the child to mix and match and create her family as close as she can. The make-up of the American family in 2009 has no one model. Families may have a father and mother, bi-racial members, single-parent households, gay parents, grandparents, foster parents, and the list could go on. Our job as early childhood educators is to validate and support every child in our care. Regardless of our own background or value system, we must realize that the child is the most important part of our classroom. Our support and validation is critical to help the child become well-adjusted and resilient. I was traveling on an airplane this week and I had the privilege of sitting next to a mechanical engineer. He was traveling for work on his latest project, a new medical device for heart patients. I was fascinated by the new procedures he was explaining, but he seemed just as fascinated with my early childhood knowledge. He has two small children and admitted that he and his wife don't always know the best approach for teaching their little ones. Our conversation evolved to a discussion about building capacities in the brain. I told him how critical it was to give young children as many experiences and support as possible so they can build as many brain connections as possible (check out Dr. Jean's information). We know that the connections formed during early childhood will have life long effects. We discussed how his new device might help patients avoid a heart bypass operation, but there was no shortcut to providing young children with positive, supportive experiences during these critical years. Early childhood is the time to build strong brain connections. I continue to admire all of the wonderful people in the world that devote their lives to young children.